Accra, Jan. 5, GNA - President John Agyekum Kufuor will on Friday, January 7, have his name printed in Ghana's history as the first President to win an election while in opposition and be re-elected for a second term. 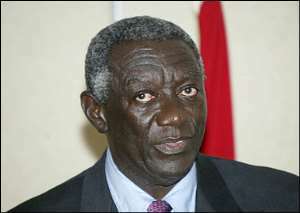 President Kufuor's first tenure in office began on January 7, 2001 when he was sworn in as the fifth President of Ghana. Two years later on January 31 at the 26th Session of the Economic Community of West African States (ECOWAS) held in Dakar, Senegal, he was unanimously elected Chairman of the sub-regional body for a one-year term to succeed President Abdoulaye Wade of Senegal. His mandate was renewed for another year to end in January 2005. President Kufuor turned 66, a day after his second tenure of office was renewed in the 2004 Presidential election. He was born on December 8, 1938, at Damang in the Ashanti Region to Nana Agyekum, Oyokohene and Nana Ampoma Dapaah Apagyahemaa of Ashanti. He began education at the Government Boys School and Osei Tutu Boarding School and continued at Prempeh College (1954-59) all in Kumasi. President Kufuor entered Lincoln Inn, London, where he obtained a degree in Law, Political Science and Economics in 1959 and Oxford University in United Kingdom, from 1961 to 1964 where he obtained BA (Hons) Philosophy. He also has a Master of Arts degree. President Kufuor started his working career as a Kumasi-based private legal practitioner from 1965 to 1969. He was City Manager and Chief Legal Officer of the Kumasi City Council from 1967 to 1969. He was a member of the Constituent Assembly that wrote the Second Republican Constitution in 1969 and became the Parliamentarian for Atwima Nwabiaga on the ticket of the Progress Party in 1969-1972. President Kufuor was appointed Deputy Minister of Foreign Affairs during the Second Republic (1969-1972). He was again a member of the Constituent Assembly that wrote the Third Republican Constitution in 1979 and entered Parliament again for the Atwima Nwabiagya Constituency on the ticket of the Popular Front Party (PFP) in 1979-81. President Kufuor was Deputy Leader and Spokesman for the PFP on Foreign Affairs in Parliament. In 1982 President Kufuor was appointed the PNDC Secretary for Local Government but he resigned a few years later because he did not agree with the philosophy of that regime. In 1992 he contested for the New Patriotic Party (NPP) presidential slot, but lost to Professor Albert Adu Boahen. He again contested the party's presidential slot in 1996 and won to lead the Great Alliance, which comprised the People's Convention Party (PCP) and NPP. President Kufuor lost to former President Jerry John Rawlings in the 1996 December Presidential election. He was chosen again by the NPP in 1998 as their Presidential candidate and won the 2000 Presidential election after a second round of voting. President Kufuor has served on several Boards, including being Chairman of the Ashanti Brick and Construction Company as well as Cojak Company Limited between 1973 and 1978. He was the Chairman of the Board of Directors of Kumasi Asante Kotoko Football Club from 1988 to 1991. President Kufuor is married to Theresa, a midwife and they have five children.